The Zorki 4 is a 35mm rangefinder camera made in Russia between the late 1940’s and the late 1970’s. It was basically intended to be a copy of the Leica rangefinder camera – an extremely popular and very expensive camera. This model is the Zorki 4k which was one of the later models made. This is a rangefinder camera, which means that to assist in focusing the camera there is a split image in the viewfinder which comes together at the point of focus. This was a common mechanism for focusing cameras before SLR’s came to dominate camera manufacture. 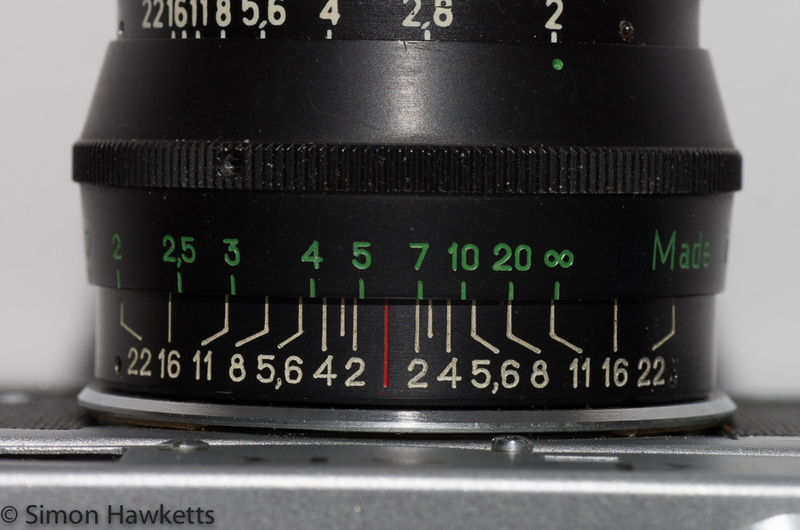 To accommodate the rangefinder action there is a small window above the lens. The camera has a shutter range from 1/1000 to 1 sec and the lens covers f/2 to f/22. There is a self timer fitted, and a socket to connect a flash gun. Although a flash mount is fitted on the camera top plate, there is no ‘hot shoe’ connection. The lens is interchangeable and is fitted by way of a 39mm leica screw thread. The example I have is fitted with a 50mm f/2 “Jupiter 8” lens which I assume is the unit fitted when the camera was bought. I also have a couple of other 39mm screw thread telephoto lenses acquired from my Father, but they look pretty poor quality. The rangefinder mechanism is coupled to the lens by way of a small lever mounted internally which touches the inside of the lens. As the lens is focused the lever moves which makes the two images inside the viewfinder come together. It looks a fairly Heath Robinson arrangement and I would think that it would be difficult to get shots in focus with this particular example. There is a push fit lens cap to protect the lens when the camera is not being used. The shutter speed is adjusted with a dial on the top plate of the camera, next to the shutter release. An oddity of the camera is that the shutter speed should only be set after the shutter has been cocked (or in other words, when the camera is wound on ready to fire). So to set the shutter speed you wind the camera on for the next exposure, lift the shutter speed knob and turn it to the speed you want, let go and the knob clicks into place and then fire the shutter. Apparently, if this procedure wasn’t followed it could damage the shutter mechanism. I wonder how that would go down these days ? I can’t see it being overlooked somehow. There is a self timer mechanism fitted to the front of the camera. It’s a standard mechanical mechanism which you use by setting the shutter, winding the self timer round and pressing the small button above the self timer. The mechanism then winds down and about 12 seconds later the shutter fires. The aperture is set by way of the dial on the lens. There are no click stops – the aperture simply adjusts between f/2 and f/22. One nice feature, which is often missing on modern lenses is the depth of field scale on the top of the lens, which allows you to see how much of the picture will be in focus at any particular aperture. For example if I set the camera to f/11 I can set the infinity marker to the right most f/11 marker and I know that everything from 3 meters (where the left most f/11 marker matches) to infinity will be in focus. Putting a film in the camera involves taking the bottom half of the camera off ! There are two locks on the bottom plate of the camera which are lifted and turned to release the back plate. Once this is removed the film is fitted in a fairly conventional manner. Once the film is complete it’s wound back into the cassette with the rewind knob at the opposite side of the camera to the film wind on lever. I have never put a film through this camera, and the viewfinder seems to be quite mucky and dim so I suspect its seen better days. It might be interesting to try a reel of b/w however – if I do that I’ll post the pictures. The manual for this camera is available on-line here. Actually, having written this piece I’m more tempted to try a roll of film through it ! I too dusted off my Canon EOS 88 today.. still looks modern 🙁 …would be at least 3-4 decades before it looks remotely vintage. I am actually looking for a film medium format.. lets see if I find it. I am following you Sir. Shall look forward to it! Great blog, I own one of these beauties too. They are built like tanks aren’t they! Like you I haven’t tried a roll of film yet. I’ve recently been scouring ebay to see if I can find a Zenit E and an Olympus OM20 which I’ve owned in the past and now regret getting rid of. Have you shot off any film with this? Looks to be in really great shape. I am so tempted to try one of these on Ebay but have heard many mixed reviews on the quality of what really gets purchased. I haven’t – it is technically my dads but he doesn’t do much photography anymore so he gave it to me. I believe he has put film through it though. I bought my Zorki 4K from my father-in-law after he acquired it, then decided he preferred a Canon SLR. I found that the Jupiter 8 lens gave better results with mono film than colour. Colours in the prints looked a little wishy-washy. Following an inheritance I bought a Leica M3 double stroke body, circa 1955. I got a screw-bayonet adapter and mounted the Jupiter 8. I’ve used this combo for the last 9 years. I found that a deep lens hood benefits performance. Keeping to mono, I’ve been using Ilford XP2 Chromogenic film and get very good results. I have compared shots taken with the M3 + Jupiter with similar shots taken with a Nikon F + 50mm f1.4 S lens, and they are indistinguishable from each other. I then compared Leica/Jupiter with shots taken with a Nikon F3 and a 50mm f2 lens using auto exposure on the F3. Again, no difference. Of course I keep the Jupiter well stopped down and have never shot it wide open. Yes, I know, Leica purists will be horrified: a Russian lens on a Leica. However the Jupiter 8 does have its aficionados. A friend bought the Zorki from me after seeing a Jupiter 12, 35mm f2.8 for sale and uses the 50 viewfinder knowing he will get more in his shots. Me? I’m very pleased with my marriage of Leica/ Jupiter and can heartily recommend this lens. I painted over the script on the side of the lens that said ‘made in USSR’ with black paint, the deep lens hood hides the writing around the front of the lens. I’ve tested the rangefinder with this lens and a long tape measure: it’s surprisingly accurate. For street photography, I often use the depth of field markings to set hyper-focal distance for quick shooting.